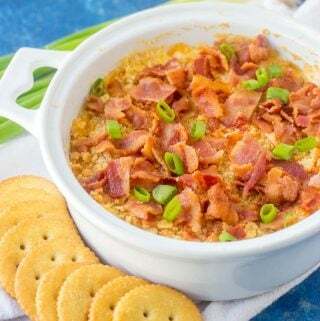 Full of cheese, bacon and green onions this Charleston Cheese Dip whips up in less than 20 minutes and is a delicious dip to have on hand. In bowl stir together cream cheese, mayo, cheeses, onions, cayenne, garlic powder, salt and pepper. Bake for 15 minutes until soft and cheese is melted. Top with crumbled bacon and more green onions. Serve with crackers, chips, etc.